I have missed you all. Big time! I have been doodling along, wrapped up in raising a teenage boy, my "foster" son, Victor, who I am proudly about to see graduate high school. He was wobbling with school when he came into our lives 6 months ago, but now has a 3.5GPA. Proud Mama Me! My hand is healing....and I am so grateful that I avoided the complications that others have experienced. I am ahead of schedule in terms of mobility says my OT, but ouch, still very tender. So therefore, though I am champing at the bit to build planter boxes, landscape my front and back yard and get back in the studio much more, I just have to wait, be patient - something that does not come naturally to me. Seriously, there is the dearest woman-creative-artist-subscriber who sent me an email amonth or so ago saying she was sending along a care package for me after my surgery. 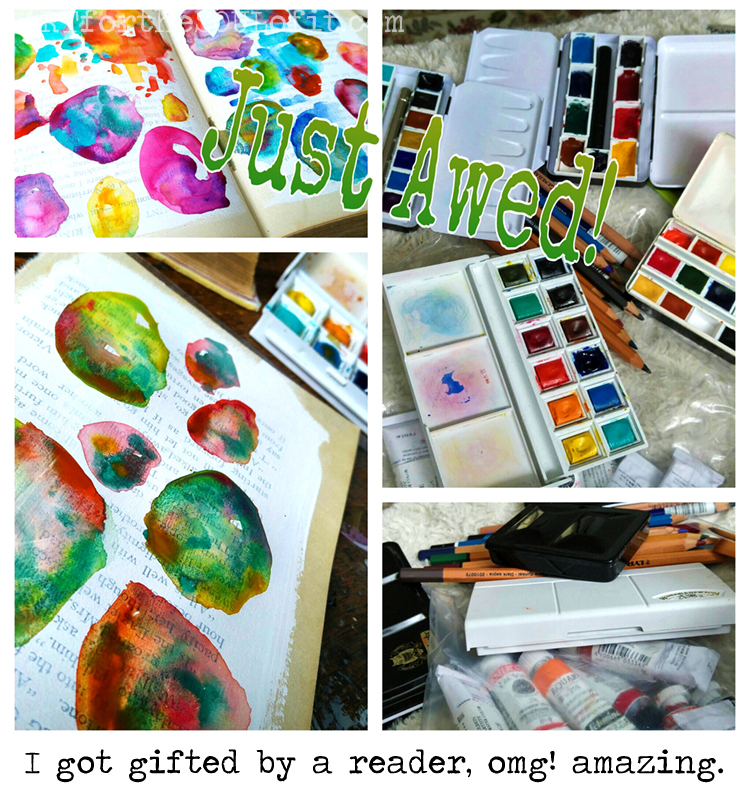 It was a huge box, and so full of watercolors, colored pencils, half and full pans of fresh artist grade watercolors, and on and on and on. I was gobsmacked. She insisted she hadn't sent me all her supplies. Fast forward, she sent me yet another care package and there aren't enough pictures to show all that was in this treasure box. But the above is a teensy weensy smattering. And I am having a blast revisiting the lovely luminance of transparent watercolors. And of course all I need to do is take out my white gouache and mix is all up and then I am in my Gouache Bliss Zone. God bless you, Cathy. Wow, just Wow. And gratitude galore! Every word was a delight! So happy you are healing, thrilled that Victor is doing so well! (Please give him a hug from me) and absolutely thrilled over the generosity and thoughtfulness of Cathy. 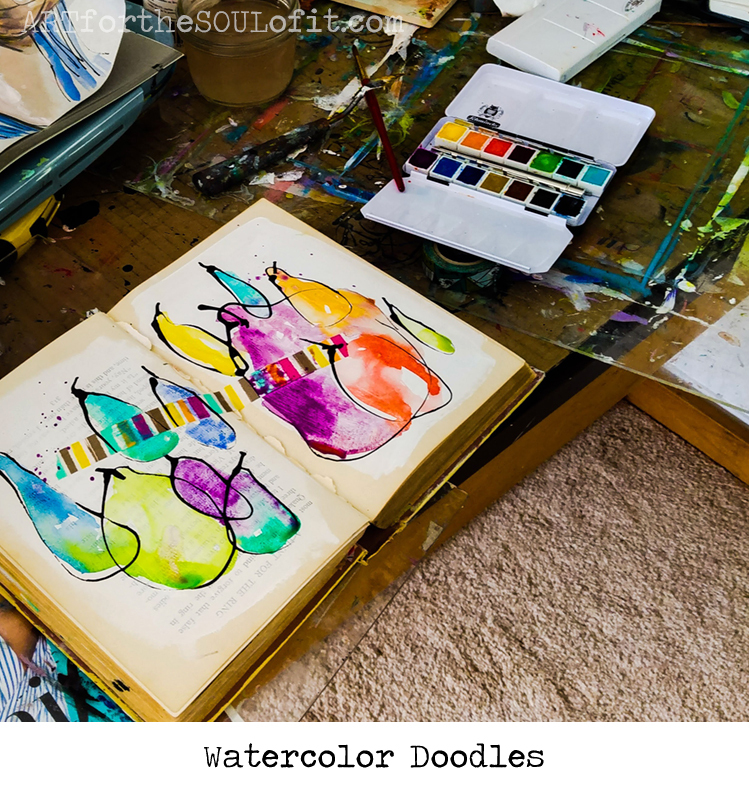 Of course, I'm happy she nudged you to enjoy watercolor again! Thanks, Chris. Life is good....even when full of challenges, eh? Something we learn as we age. I had a client once tell me, "Even the hard times are good times." He was so right. Loving your new watercolor floral mandalas. Gorgeous! What a blessing! Enjoy and get well :) Fun! Thanks so much, Sheila. So much watercolor, so much fun!